Mason Mount has been called up to the England squad. Derby County midfielder Mason Mount has been called up to the senior England squad for the first time. The 19-year-old, who has impressed at Pride Park since arriving on loan from Chelsea in the summer, has represented his country at various age groups from the U16s to U21s and his form this season alerted England boss Gareth Southgate who was present at the Rams' game with Blackburn Rovers last month. Mount has scored five times in 14 games for the Rams this season having impressed on loan at Vitesse Arnhem in Holland last year. 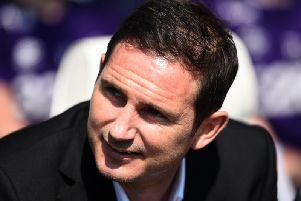 Rams boss Frank Lampard said: “I’m delighted for Mason and it’s a deserved call up. I appreciate and say thanks to Gareth Southgate and Steve Holland but it is their job and if they have seen that Mason is performing well enough to get in then we are thrilled for him who deserves it on his performances. “He’s had a season on loan last season where he did fantastic, he was maybe off our radars being in Holland but what he’s doing now has catapulted him into the thinking and I’m really pleased. I’m sure he will do himself justice when he trains with them. “The good thing about Mason is that he has everything. When I say that, it’s not just his qualities on the pitch, they are all very evident and there is a lot more to come. He has a lot more uplifts still to come which is great news but his personality and mentality, to want to improve, to take things on board, to not be overwhelmed and to have humility in the way that he trains, and how he carries himself, but to have an inner confidence, that’s what sets him apart for me. “All those landmarks are due to hard work, good quality and they will keep on coming. It’s a great test for him and he won’t be overawed. There is something inside Mason where he feels like an England player, with a lot of humility with it which is a great mix. “It’s one of the highest accolades you can get. I said to him that’s it’s only just begun now. Once you are in there you either stay or you drop out so all this positive talk around him now brings a new challenge of what he can do. People look at Mason Mount as an England player now so that brings a new challenge for him.